Regional wholesale is one of the most efficient means of supplying Oregon’s foodshed with local agricultural products. Yet, not only do existing processors and distributors lack the capacity to meet local demand, but many Oregon producers lack resources to grow to a scale where they can supply this demand. 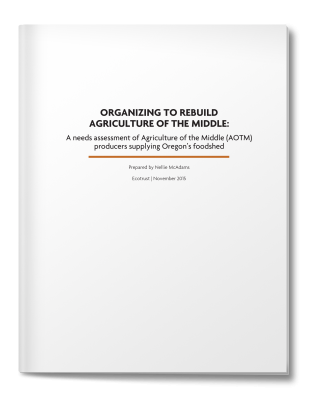 The purpose of this whitepaper is to inform Ecotrust’s Food and Farms Program on the needs of Agriculture Of The Middle (AOTM) producers supplying Oregon.